Well, maybe the extreme cold spell this weekend will do it, but so far the pickings have been extremely slim. There are some bald eagles hanging around near Beacon, NY, outside of the area I covered last year. Yesterday for the first time this year, I photographed an eagle in Verplanck, NY, where I spent many hours and took thousands of pictures a year ago. So far, it's nothing like the dozens of eagles you would see every day last winter. So, just in case we still do get lucky and the eagles once again move to this area, I'm publishing this guide now. It focuses on locations along the eastern shore south of the Bear Mountain Bridge. It's based on my own observations over many days last year and on information from others who have been observing bald eagles for years. Chances are you find the bald eagles in one of two kinds of places. The first one would be tall trees along the river, from which they have a vantage point to cover action over a vast stretch of the river. The second one are the ice floes floating on the river, provided the river is partly frozen. Even if the river is frozen, the Hudson is a tidal river in this area and the presence of the floes varies during the day and can change drastically from one day to the next. They're large birds and the trees are bare, so it's actually not that hard to see them if the trees aren't too far out. On the ice, it's even easier to spot them. They're always far away, so you need a long lens, minimally 400mm. Other than the distance, a challenge is that the eagles can quickly fly from one location to the other. That eagle flying to the other shore? It'll take you at least half an hour to get there. That eagle flying around the corner? You'll never get there, as you can't access the shore line there. Some people, like me, spend some time in some locations but also drive from one to the other in the hope to find some action. Others, especially those with heavy lenses and tripods, tend to stick to one place and hope for the best. Of course, it can get cold, really cold, along the river. I went almost every morning last February and March, with the exception of days when it snowed and the roads were unsafe, and found that wind is your main enemy. A bitterly cold day without wind is much better than a mildly cold day with strong winds. Luckily, eagles aren't that active on windy days, so you won't miss much by staying home on a windy day. Sunny days are preferable, of course, both for your well-being and for your chances of getting good shots. It's hard to get a decent shot with nice contrast on the feathers in overcast weather. Since the Hudson runs north-south, in the morning you will have the sun behind you shooting from the eastern shore and then it will move straight over the river. So, in the afternoons the light is better for shooting from the western shore. As I wrote, you need long glass. The Hudson is wide, the eagles stay far away from people and you cannot get any closer. For the second, you need long glass and it's better to have fast autofocus and high shutter speeds as well to catch as much of the action as possible. You also want as many frames per second as possible. The difference between a perfect shot with the birds and their wings aligned just right and something that's not usable, is often a fraction of a second. For the third, depending on where you are and how close they fly, your longest lens might be too long, so a zoom lens is handy to quickly zoom out and be able to get the whole bird in the shot. You're probably still talking 400mm, but the challenge can be that the bird is too large in the frame and you're cutting off the wing tips. You need a camera that focuses fast enough to be able to track the eagle as it flies over. The fourth opportunity, and any other action over the river, can be the most challenging to your gear. It depends a bit on how far away the bird is, but if it's too far, the heat waves rising for the river destroy any semblance of sharpness. If you're lucky, that effect is behind the bird and you and your camera can keep focus on the bird. That can be a challenge if the eagle is not large in your frame and the background is contrasty, in which case the focus point(s) might jump to the shore line with its contrast and render the bird into a dark gray blob. By far my favorite location. Jutted out onto the Hudson, in the shadows of a nuclear reactor, Verplanck boasts several spots where the shooting can be very good to excellent. You reach Verplanck by following Kings Ferry Road from Route 9A. Driving into Verplanck, you pass a lake on the right side and a marina on the left. Past the marina, you take a left into Riverview Avenue. There you start looking for eagles. Sometimes, the eagles swoop down into the water of the marina. You might find them on the ice, in the trees or on the poles of the docks. There's a small parking area on the right, if you want to stop and get out here. Drive a bit further and you pass a mobile home park on the left. You can drive into the park, but it's easier to drive past the mobile homes and turn into the boat launch area on the left. Don't do this if it's not plowed yet. You could get stuck, especially if you don't have four-wheel drive. At the boat launch, depending on how high the river water is and how much ice has pushed onto the shore, you can walk over the rocks in the direction of the marina or through a park into the other direction, giving you a pretty wide area to reach. From here, you might see eagles on ice floes in the river, behind you in the trees or flying over Stony Point on the other side of the Hudson. If you're lucky, you'll catch some flying past or going for a bite. While this is a good spot, the light here starts turning against you sometime during the morning. Moving further, past the boat launch, look up to the trees on the right side behind and next to the white house on the hill. It's almost a given there will be one, two or more eagles hanging out in those trees. You can stop a little further down and take pictures from the side of the road. You can also leave your car there and walk into the park along the river, which brings you to the area adjacent of the boat launch. The best spot is further down the road, though, at Steamboat Dock. This is also where you will find those photographers with their 800mm lenses on heavy tripods. From the parking lot, you have a view in three directions, roughly north, west and south. As the sun turns over the river, you can still shoot here for much longer than in the locations just facing west. Eagles hang out on ice floes, might go for fish really close to the shore and soar close overhead. If you can go to only one place and there is ice on the river, go here and stay. Nothing might happen for a long time and, suddenly, seven eagles show up going after a fish on an ice floe not too far away. I wish I could say there are more spots in Verplanck, because you can see the eagles fly around the corner and you just know that if only you could reach the river, you'd have a good vantage point. I've tried, but the other roads leading to the Hudson end in pretty depressing fenced off industrial areas. A bit out of town, the Indian Point nuclear reactor blocks all access to the river. As you head out of Verplanck on Broadway, keep going straight. You're passing a cemetery, the entrance to the nuclear plant and a small estuary. Turn left after the estuary and you're at Charles Point. The river view isn't really clear here, but you might find eagles around the dock and in the trees. The hardy can also park on the other side of the estuary near the playing field and walk through the woods to the edge of the Hudson. So far this year, Charles Point has been the place where I've consistently seen an eagle or two, but never close enough to warrant taking a picture. If you keep on driving past Charles Point, you'll find Fleischman Pier on the left, next to the entrance to the county incinerator. There's a small parking lot, said pier and a park. The view over the Hudson is wide open. The only times I've seen eagles here, they were always too far away, but others have had good luck here. If you drive on out of the Fleischman Pier parking lot and keep on hugging the Hudson in Peekskill, you can reach the shoreline again behind Peekskill's train station. You're looking out over the same area as you did from Fleischman Pier. Later in the season, at least last year, as the Hudson was no longer frozen but its estuaries were, the area at the Annsville Creek Paddlesport Center was a last hangout for eagles that stuck around. The water here is separated from the river by the railroad, but it's wide open. You can park at the kayaking center right off Route 6, leading up to the Bear Mountain bridge. While this park is always mentioned in lists of places to find bald eagles in the winter, I've never seen one here close enough. Sure, I've seen a bunch of them fly above the far end of the park, but that's too far and getting closer would mean trekking through the woods, a long slog in the snow. Still, it's on my list places to check out since others have seen them here. You reach it by taking Dutch Street off Route 9A. Sunset Road connects Dutch Street with Kings Ferry Road, providing you with a shortcut between Prince Georges Island and Verplanck. 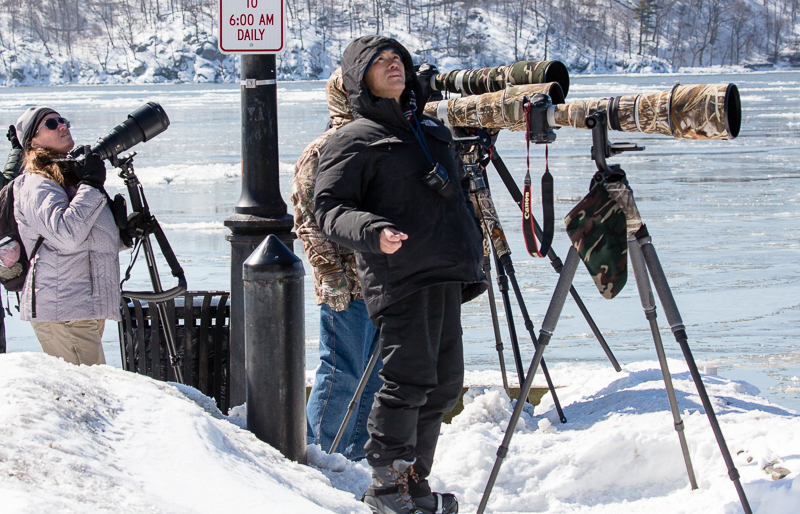 Croton Point, right off Route 9, is a vast area and a haven for bird photography. In the case of eagles, you might find them off to the right as you drive into the park in the trees lining the little bay. You should also check out the area around the nature center, which you reach by driving into the large parking lot and up the hill to the right. And they might hang out along the Hudson itself in the picnic and play area off the main parking lot. Last year, the dirt road leading all the way to the tip of the peninsula was open and I drove out there once and saw some eagles on the ice. The woods are dense there, though, and it's hard to get a clean shot. The dirt road was also very muddy, really a mix of mud and snow, and I wouldn't make that drive again unless I was in an SUV or truck. So far this winter, the dirt road has been closed off. People apparently also had good luck near the Croton Harmon train station, next to Croton Point. You turn into the station parking lot and drive all the way to the end, past the station lot and the public works department. While the eagles spend the day hanging around the Hudson looking for food, many of them fly to the New Croton Reservoir to roost for the night. The best place to see them there is to go to the top of the New Croton Dam, from which you have a wide view over the reservoir. If you're lucky you see them fly over relatively close, though they will have the sun behind them as they approach the dam from the river. You can see them roost in the trees alongside the reservoir and might see them on the ice. You will have to park at the bottom of the road leading up to the dam and walk up. It's a short walk and not steep. The dam is off Route 129, just past the entrance to Croton Gorge Park, if you're coming from Route 9. Bald eagles are a protected species and you're not allowed to disturb them. So, trying to get them to fly out of a tree by making loud noises or approaching too closely can get you in trouble. Local and New York State Police do patrol the areas mentioned in this guide, but more importantly, bystanders and locals will frown on your behavior and tell you off. Some of the areas are close to the heavily protected Indian Point nuclear power plant, which sits along the Hudson between Verplanck and Charles Point. While you can in principle hike through the woods to get closer to the Hudson, you really don't want to find yourself too close to Indian Point or the ConEdison land next to it. Chances are you will get in trouble. So, even though I checked out one particular location that some locals mentioned (after the snow had melted and I could actually see where I was going), I'm not including it here because those same locals weren't sure where exactly the property line ran of the ConEdison land. As I said earlier, this guide might be all for naught this year if the bald eagles stay further north. In that case, plan some trips to the Conowingo Dam next winter, where you're much more likely to get some awesome eagle shots in a few days than spending many days along the Hudson. Or travel to the top spot for bald eagles, Haines, Alaska.